First Lady's Oscar Night Role: Prelude to a Bigger One? Michelle Obama’s cameo at the Academy Awards ceremony came late at night on the East Coast, but it came early in the president’s second term -- a satellite-aided appearance that helped fuel expectations about what the first lady might have in mind for herself after her husband leaves office. On Sunday, Jack Nicholson and the movie industry swells gazed rapturously at the giant monitor inside Hollywood’s Dolby Theatre as the action switched to the Diplomatic Room of the White House. 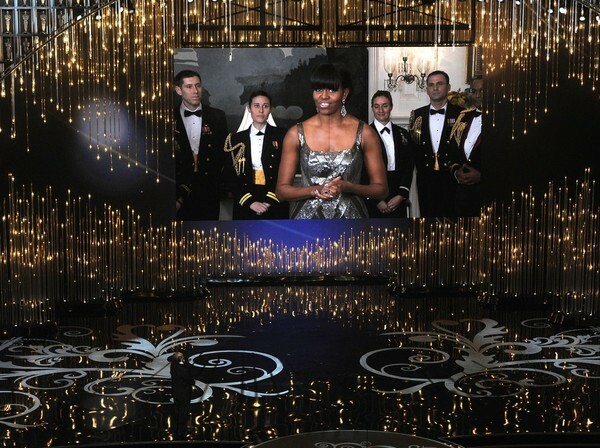 There, Mrs. Obama, wearing a Naeem Khan dress and flanked by active military personnel, announced “Argo” as the winner of the Oscar for Best Picture. It was, in some ways, a curious appearance. Why was she doing it? What was the point? In other ways, it was a no-brainer: a glamorous and statuesque 49-year-old first lady is offered the chance to bestow Hollywood’s greatest honor before a global television audience of 1 billion people. Why not? That was fine, as far as it went. But with Hillary Rodham Clinton’s transition from first lady to senator to 2008 presidential candidate still fresh in our minds -- and with Mrs. Clinton possibly waiting in the wings for 2016 -- questions about Mrs. Obama’s political future arise naturally. In four years Michelle Obama will exit the White House a vibrant 53-year old recognized as one of the most popular and admired women on the planet. She will be able to do just about anything she wants. So what might that be? Could it include a run of her own for higher (or even the highest) office? Liza Mundy, author of a generally sympathetic Michelle Obama biography, says this is a question she gets all the time when she gives speeches about the first lady. In “Michelle, a Biography,” Mundy relates how Mrs. Obama tried to steer her husband into a more secure line of work running a nonprofit foundation. Mundy also writes about how, as a girl, Michelle’s up-close look at the seamy realities of Chicago’s infamous political machine made those in her family mistrust politicians -- at least until Barack came along. Others close to the first lady echo the fact that while she is intensely competitive and is in many ways a more naturally gifted politician than her husband, she still looks scornfully upon his chosen profession. Would Mrs. Obama risk all that for an elective run of her own, perhaps in Illinois, or even nationally? Mundy still thinks not, believing -- although she’s much less certain than she used to be -- that Mrs. Obama would be most comfortable giving inspirational speeches and taking the helm of a large nonprofit organization. Such a path would allow her to remain (mostly) above the partisan fray and would indicate an awareness that one of the reasons she’s so popular is that she has tempered her own political views while concentrating on two issues -- the needs of military families and healthier eating and exercise habits for American kids -- that are not very controversial. Even putting herself in a position that prompts speculation about her running for office -- by, say, hogging the spotlight on Oscar night and making a semi-liberal little speech extolling Hollywood’s values -- places the first lady in a different light. Similarly, Noel Sheppard, a writer for the conservative outlet Newsmax, took aim at late-night host Jimmy Fallon for his “gushing and fawning” recent interview in which he asked the first lady whether she might be considering herself as part of a “Dream Team” Democratic presidential ticket headed by Hillary Clinton. It’s true that the interview was fawning, but it’s also true that it was accompanied by a hilarious bit in which Mrs. Obama and Fallon (dressed as woman) reveal the “evolution of mom-dancing.” Mrs. Obama’s abilities as a performer -- and a dancer -- are not to be underestimated. Moreover, she parried Fallon’s softball “Dream Ticket” question with a quip about replacing Jay Leno -- a job Fallon has in mind for himself. After the Oscar performance, University of Virginia presidential scholar Barbara A. Perry also found herself wondering about Michelle Obama’s political future. Perry, who has written extensively about presidential wives, places the post-World War II first ladies on a continuum ranging from Hillary Clinton and Eleanor Roosevelt at one extreme -- women with a yen to hold power in their own right -- to those with the opposite impulse. The latter “are the women who want to leave the White House as soon as they can, who didn’t want to be there in the first place,” she said. “They say, ‘I want to go home when this is over and pull the covers over my head.’ ” Bess Truman is the outstanding example of this type -- she didn’t even live in Washington much of the time her husband was president -- with Pat Nixon somewhere close to that example. Although the rest of the presidents’ wives are somewhere in the middle, Perry suggests that resisting the maelstrom pull of politics isn’t easy for any of them. In her book “Jacqueline Kennedy: First Lady of the New Frontier,” Perry explores how Jackie’s impulses were to eschew the political life, but that as first lady she threw herself into the cause of historic preservation. Sitting around in her robe isn’t really the athletic Michelle Obama’s style. After all, her signature issue as first lady is the “Let’s Move!” initiative designed to encourage children to eat right and exercise more. As part of her nationwide tour Wednesday and Thursday celebrating the third anniversary of launching that effort, Mrs. Obama spent the first part of this week taping national television and radio interviews. Is that a harbinger of something else to come? For what it’s worth, such speculation is not being openly encouraged by the first lady. Carl M. Cannon is the Washington Editor of RealClearPolitics. Tom Bevan is the Executive Editor of RealClearPolitics. They are co-authors of the new eBook series, The RealClearPolitics Political Download.